Sankhu is the ancient Newar town located in the north-eastern corner of the Kathmandu Valley in about 17 km from the capital city Kathmandu. Before Malla Dynasty in Nepal, Sankhu was said to be a separate kingdom. The historical Durbar square (Layaku) has still been preserved. The temple of Bajrayogini (Khadgayogini) is one of identity of Sankhu. It is situated in middle of the hill. Located approx. 7000 ft (2000 m) above Sea level and 32 kms from tourist hub Thamel, Nagarkot is a world famous hill station commanding breathtaking views of the majestic Himalayas, rolling hills, deep valleys, lush pine forests in a quaint rural atmosphere. This is a panoramic Nature trail walk with stunning views of the majestic Himalayan range along with the best views of Nature. Fresh Mountain air, a sparkling snow covered Himalayas, Nature's freshness. The good walk from Sankhu to Nagarkot is a much recommended one. 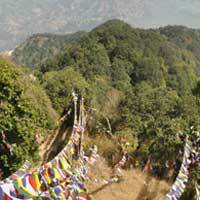 The bumpy road to Nagarkot goes always uphill and can be reached in about 3 to 4 hours from Sankhu. 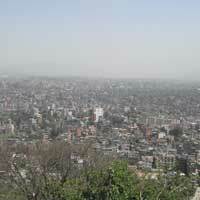 Either you can visit sunrise view from Nagarkot early morning drives and return hike to Sankhu. 08.00 AM: Drive to Sakhu, 45 minutes by Car. 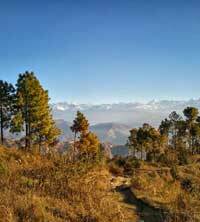 09.00 AM: Hiking start to Nagarkot 3- 4 hours follow off road and climb to Nagarkot (2175m). 12.30 to 01.30: PM: Lunch on the way. 03.00 To 04.00 PM: Arrive in Nagarkot, take a rest and wait for sunset view. 05-06.30: PM: Enjoy the sunset view and take picture.